This is Wallaman Falls in the Wet Tropics World Heritage Area. 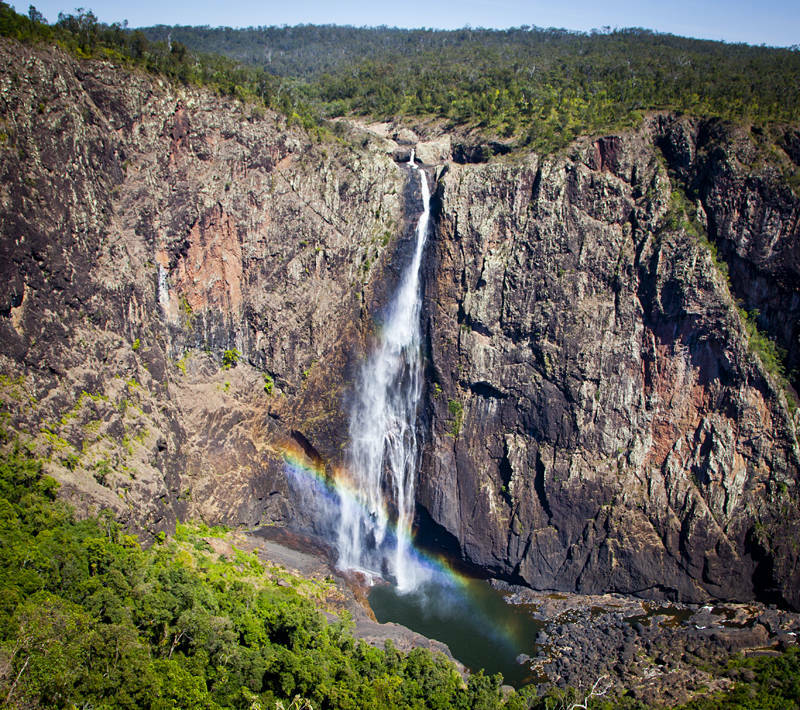 It is Australia’s highest permanent single drop waterfall. This photo was taken from a viewing platform a short walk from the national park campsite. From here you have the option of walking down a track to the base of the falls. Once you start the decent helpful signs remind you of the various dangers you will face and how previous walkers have died. Along with the standard crop of deadly snakes and spiders, there is a native stinging tree which releases a neurotoxin and a bird capable of delivering a fatal blow. After surviving the solitary trek down the hill I was somewhat relieved to find the base of the falls occupied by about a dozen people scattered about in small groups. On closer inspection, everyone looked about half my age. Evidently only the fit or foolhardy attempt this path. Being the old man on the hill for a change was an unusual reversal. Generally, my fellow travellers are grey nomads(A breed of Aussie who on reaching retirement sell their house, buy a caravan and start doing laps of the continent) I think these coffin dodgers are discouraged from visiting this spot by declaring the access road is not suitable for caravans despite it being tarmacked the whole way. My classic van had no trouble climbing the mountain in 3rd gear. I did, however, find myself employing the Jamaican taxi drivers technique of using the horn before blind corners. While the weather and road conditions stay good I will continue North. It is probably too late in the season for my old van can make it all the way to the Northern tip of Australia this year as the dirt road will be quite rough by now. I am planning to get as far as Cape Tribulation by the September equinox before turning inland towards Mount Isa and then down through Queensland’s outback before “The Wet” arrives. Nice picture. How much ‘help’ did the rainbow need to render? Take care on your solo treks. No photoshopping on this image. However these days when I shoot waterfalls I usually visit them twice, After the first shoot, I work out the best time of day to have sun in the best position. For this shot, the biggest rainbow was just after midday on a windy day. If you look closely it is a double rainbow.